Ukrainian traditional skirt (plakhta) and belt (kraykas) are important part of Ukrainian traditional outfit. Please also check our offers to find discounts for buying full set of cloth. Black long satin skirt is perfect match for any Ukrainian blouse. For ordering it we will need Your .. 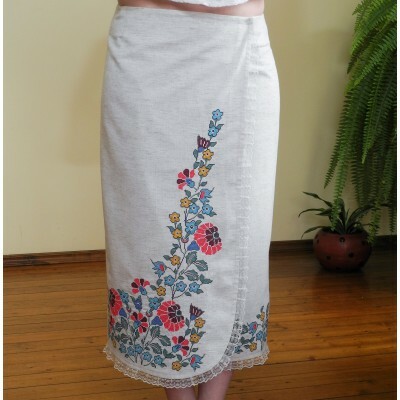 Warm cashmere skirt with bright embroidery in traditional Ukrainian style. 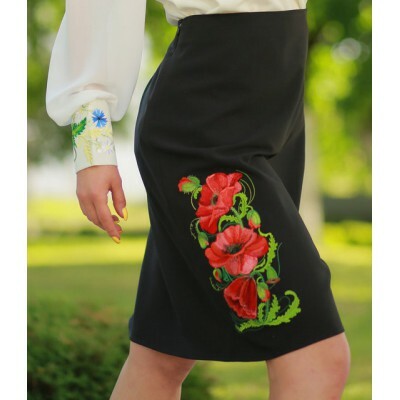 This skirt will be perfec..
Mini skirt with embroidery of poppies in Ukrainian style.Sizes: XS-XL2Material: cotton-memoryLength ..
Mini skirt with embroidery of poppies in Ukrainian style.Sizes: S1-L2Material: habardineLength of M1..
Full Ukrainian Dance Folk Ladies Costume of: 1. Long White Blouse with embroidery (to buy separ..
Red long satin skirt is perfect match for any Ukrainian blouse which contains red embroidery. For or..
Mini collection "Arezou" with a slight hint of Oriental motives with perfect Ukrainian embroidery, m..
Ukrainian Plakhta "Ancient Times 2"
Long Ukrainian woven plakhta on zip.Sizes: XS-M2Material: woven fabricLength of S2 size: 82cmSize ch..
Short Ukrainian woven plakhta on zip.Sizes: XS-M2Material: woven fabricLength of M1 size: 50cmSize c..
Short straight Ukrainian woven plakhta on zip.Sizes: XS-XL2Material: woven fabricLength of M2 size: ..
Ukrainian Plakhta "Voice of Carpathians 2"
Long straight Ukrainian woven plakhta on zip.Sizes: XS-XL2Material: woven fabricLength of M1 size: 1..
Ukrainian Plakhta "Voice of Carpathians"
Short straight Ukrainian woven plakhta on zip.Sizes: XS-XL2Material: woven fabricLength of M1 size: ..